ASADI strikes again. The self-professed purveyor of “Persian trap music” has once more turned to American television as a source of inspiration for one of his clever, genre-bending remixes. Previously, ASADI miraculously united Kanye West with SpongeBob SquarePants. The time has now come to abandon whimsical, colorful Bikini Bottom for the much drearier environment of Scranton, Pa. ASADI’s latest creation combines a verse from Kendrick Lamar’s 2012 track “Poetic Justice” with Jay Ferguson’s catchy, plaintive, piano-driven theme song from the American version of The Office. To be sure, this is a high-concept pairing, and ASADI makes sure not to overstay his welcome. The whole thing is over in a minute. As before, the modest accompanying video shows a bit of the remix artist’s creative process. First, using only his left hand, he plays the familiar TV theme on a small keyboard. Then, it’s button-mashing time, with ASADI masterfully manipulating the glowing control panel on a sequencer situated on a desk in front of him. He’s clearly having a great time, even mouthing the lyrics along with Lamar as he goes: “Every second, every minute, man, I swear that she can get it.” Unlike many of the beaten-down, broken employees at Dunder Mifflin, ASADI is someone who clearly loves every second of what he does. He’d make a great motivational speaker. 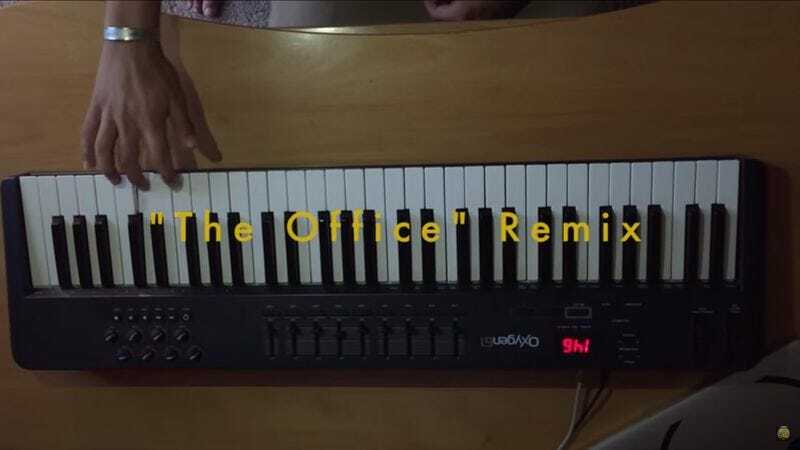 It should be noted that this is not the first hip-hop remix of the theme from The Office. Six years ago, when the long-lived NBC series was still on the air, its opening title music became the basis for a Lil Wayne-based mashup by Clockwork entitled “Office Musik.” A Monday seems as good a time as any to revisit that track, as millions of cubicle dwellers nurse weekend hangovers, squinting at Excel spreadsheets. But, honestly, there’s no wrong time for this remix. Enjoy.